Take advantage of the opportunity to focus on freeze drying technologies and processes and get a first hand demonstration of solutions for diverse requirements. Further, benefit from the workshop where you can get a hands-on experience in freeze drying yourself. In small groups, you will learn how the freeze drying output is affected by different equipment, parameter changes, solvents, etc. Lyophilization (or freeze drying) is one of the most exciting technologies in the pharmaceutical industry, although it is a very old process for the preservation of unstable materials. Trends are growing towards using non-aqueous systems. Additionally, Process Analytical Technology (PAT) systems for in-line process monitoring are used to control and determine critical processing parameters. Modern development following ICH Q8, Q9 and Q10 is based on the objective to design a lyophilization cycle applying a systematic and scientific approach instead of trial and error. Sufficient process understanding is essential to achieve a robust production process and efficient handling of post-approval changes (life cycle management) of a freeze drying process. There is an increasing trend in aseptically produced lyophilized products, including peptides and proteins. Owing to the nature of these biological products, the lyo-cycle is more complicated and, in most cases, even longer than for other medicinal products. The utility of lyophilization goes far beyond the vial. Principles of low temperature, low pressure can be applied to stabilize substances ranging from high potent APIs, novel medical devices, biologics and nanomaterials, freeze drying offers multiple opportunities. 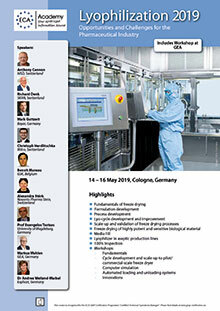 This conference addresses specialists and executives working in the fields of pharmaceutical manufacture, research and development and quality control, as well as engineers, project/facility engineers, especially those involved in the implementation of new monitoring methods for controlled nucleation, risk-based scale-up models and process technology for freeze drying processes. The conference is also of interest for participants working in the areas of container development and manufacturing process/packaging. Which are the critical limits and how are they evaluated? 100 % quality monitoring for continuous production process improvement illustrated with a lyo process application. Different inspections: container closure integrity before and after the crimping process; cake residual moisture evaluated by means of NIR spectroscopy, combined with product identification and cake defect detection; downstream inline laser coding is clearly identifying the vial as a container which fully complies to all quality requirements. On the third conference day, you will have the opportunity to take part in several parallel workshops. For that purpose, several lyophilizers will be available at GEA. Experienced GEA experts will lead you in small groups, providing an intensive experience and directly applicable know-how. Process Engineers, Pharmaceutical Technologists, Pharmaceutical Formulation Scientists, Application Chemists, Drug Development, Engineers, Particle Design Engineers. This workshop will provide each participant with an overview of a state-of-the-art production-scale freeze drying system, including system configuration and controls. For effective freeze drying, each product requires a unique recipe (formulation); these formulations are initially developed on a laboratory or pilot-scale unit and it is imperative that formulation development takes both product characteristics and the limitations of pilot and production machines into account. This workshop will examine the procedures and consequences of process development and scale-up. Demonstration of fully operative stationary and transfer cart system. Additionally, it will be possible to look at a multiple load/unload system with special features, including single row unloading and conveyance with clean-in-place functionality, and an isolator zone concept. Workshop tour including visit of shelf manufacturing area, freeze dryer testing as well as software development and simulation. This workshop will highlight new innovations of production freeze dryer and includes processing highly potent products, vial track and trace and technologies for controlled nucleation. A shuttle bus will bring you to Cologne Central Station at approximately 15.15 h.
From Cologne Central Station, frequent airport connections are available. It is highly recommended that you bring your own safety shoes, if available.